We will update in all Servers. All servers will go offline for maintenance from 1:00 am, Oct. 18th to 3:00 am Oct. 18th 2017(Game Time, PDT). Please offline in advance to avoid unnecessary loss. Sorry for the inconvenience we bring. The maintenance may be delay or advanced depending on actual situation. Warriors, how's your exploration of the steam plant going? Recently, the Holy Warrior of the Kingdom made an announcement that warriors who want to attend the King's Party still need to pass a number of trials. It is said that there is a treasure trove near the Golden Coast. It hides various treasures of the Nagas. However, under the sea where hidden threats lurk, there are all kinds of ancient creatures and brutal beasts. 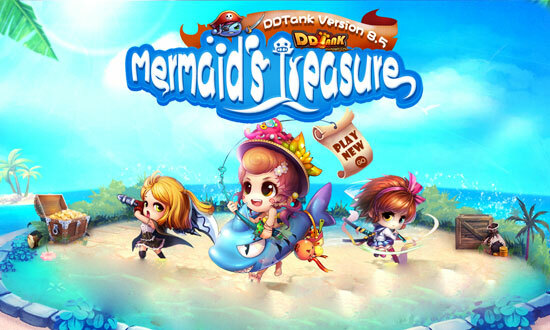 If you pass the trial, you will receive the Mermaid's treasure and be granted the opportunity to join the Party by the Holy Warrior! Warriors, go explore the sea! Have you dug a pit today? A brand new arena mode arrives! It's still a competition between players. But there is one thing different, players will compete with each other to reach the safety zone first with all members. This is a competition for pit diggers! Currently, if you join the Cross-server Free Battle on a 2-man or higher team to have a chance to join the Ultimate Escape. You can select this mode in the Challenge Room as well. Its sheath is stunning, isn't it? It is said that this new sheathed weapon is a powerful weapon with high Control and Damage. Let's stay tuned. Princess Lily from the Mainland has snuck out of the castle and gotten lost in the forest. A large number of monsters are approaching the princess. Warriors, take your weapon. Let's protect the princess together!